Covered in the Science Citation Index Expanded (SCIE). Admitted to ISI Master Journal list and covered by the BioSciences Information Service (Biosis Previews) and Biological Preview (abstract/cover page), the Zoological Record and many other review organs. We carried out a dietary analysis of Persian Leopards, Panthera pardus saxicolor, in a temperate region in north-eastern Iran, where the largest population nucleus exists across the subspecies range. We investigated 113 faecal samples collected between February 2009 and March 2010 in Golestan National Park. Faecal analysis revealed that leopards predominantly preyed upon wild ungulates, with the Wild Boar, Sus scrofa, being the most important prey species in terms of frequency and biomass. Eleven different prey items were identified, 7 of which were ungulates, comprising 99% of the total food items. We also found a spatial pattern in the prey composition of leopards: cervids were predominantly found in forest landscapes, whereas Wild Sheep, Ovis orientalis, was mainly found in steppe habitats, revealing the leopards’ predation on medium- to large-sized ungulates. Livestock remains were mainly extracted from steppe samples, but the overall contribution to the leopard diet pattern (approximately 8.5% of consumed biomass) suggested that conflict with human communities, at least within the investigated core parts of the National Park, is not a major concern. The study provides the first illustration of the Persian Leopard’s dietary composition in a temperate area with a relatively high diversity of available prey, and can be a baseline for future investigation and human-leopard interaction monitoring. The Lesser Kestrel (Falco naumanni) is a small migratory falcon which nests colonially on inland cliffs and ruined buildings. Bandar Turkman city holds one of the most important breeding colonies in Iran. It nests in holes in roofs, walls or on ledges of buildings throughout of the city. We tried to find out whether there is a relationship between nest-site selection and breeding success. Although height from the ground is the most important factor in nest-site selection by F. naumanni, height from the floor and distance to the nearest neighbour are other main factors which affect breeding success. This could be the result of accessibility by human and natural predators such as domestic cats which threaten nests. The number of possible nest-sites in the study area is limited as many old, ruined buildings are being replaced by new constructions; this colonially breeding bird species therefore suffers from a lack of highly suitable nest-sites and this directly affect breeding success. The diet of the Omani Owl, Strix butleri, was studied for the first time based on re-cently collected pellets. A total of 22 individual prey items represented three mammals (all rodents), at least two undetermined gecko species and one scorpion. By frequency, Acomys cahirinus constituted 31.8% and lizards 27.3%, while Gerbillus nanus and G. dasyurus were the least consumed prey items (4.5% each). 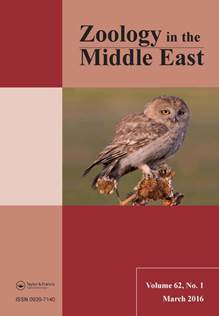 Although the Omani Owl Strix butleri (A. O. Hume, 1878) was previously reported from southern Iran, this note details the first confirmed records of this species from Mashhad (Khorasan) and Jam (Bushehr) in 2016, after recent revision of the taxonomy of this species in the Middle East. Pellets were collected under an active Long-eared Owl (Asio otus) nest in the city centre of Denizli, Turkey. The nest was located in a conifer tree in a 5.7 ha urban park, centrally-located in the city of Denizli, with a human population of 577,000 people. During April-June 2014, a total of 64 pellets containing remains of 86 individual prey items was found. All prey were Passeriformes and consisted of two species belonging to Passeridae and Hirundinidae. 78 of the 86 prey items (90.7%) were House Sparrow (Passer domesticus) and the other eight (9.3%) were House Martin (Delichon urbicum). This is one of the first studies to indicate that the Long-eared Owl’s nesting season diet consists entirely of birds. The main factor affecting this result is probably the fact that the owls live in an urbanised setting. We estimated growth parameters of Emys orbicularis and Mauremys rivulata in Mediterranean Turkey with the skeletochronological method, using specimens drowned in fyke nets. In adult E. orbicularis, the median age was 8 years in males and 10 years in females. The median age of adult M. rivulata was 10 years for both sexes. Both species reach sexual maturity at an age of 5–7 years. No difference was found in age composition between the sexes. The Iranian Mountain Viper, Montivipera albicornuta, is a venomous snake endemic to Iran. We compared the seasonal cycle of testicular activity of 74 male specimens during a one-year period in two cold mountain climate habitats: Tarom (in Zanjan Province) and Bostanabad (in Eastern Azerbaijan Province) in northwestern Iran. The maximum testicular volume was observed in both habitats during autumn. The diameter of seminiferous tubules reached a maximum length in winter and a minimum in summer. The number of spermatids increased in autumn. Spermiogenesis occurred in spring and the maximum number of spermatozoa was reached then. In M. albicornuta in Iran, the testes were more active in autumn and spring, and spermatogenesis started in autumn and continued until mating in spring. In north Khorasan province, Iran, we compared the effectiveness of two types of traps for collecting reptiles: funnel traps and pitfall traps. Three stations were monitored over three 10-day periods and in total 544 individuals (including 200 re-captures) belonging to 5 species and 4 families of lizards (Lacertidae) were collected. Funnel traps with 280 captures were more efficient than pitfall traps with 264 captures, but the differences between the two traps are not significant. Three species were captured most often in the three different stations respectively: station 1, Bunopus crassicauda (22% relative frequency); station 2, Eremias fasciata (29% relative frequency); and station 3, Trapelus agilis (32% relative frequency). Shannon species richness indices were higher for pitfall than funnel traps (i.e., 1.45 vs. 1.40), but the difference was not significant. Pitfall traps were better for capturing species that search widely for food, while the funnel traps preferentially captured species that climb plants, such as Trapelus agilis. We recommend using both types of trap to capture the various types of species in any one region. The feeding ecology of Chimaera monstrosa at a depth of 550 m was studied off Sığacık Bay, Eastern Mediterranean, in 2008. Forty males and 57 females with a length between 7.80 and 45.5 cm were caught. 33 stomachs contained food items. The diet was composed of 11 prey items belonging to 6 groups: Bryozoa, Cnidaria, Crustacea, Mollusca, Tunicata, and Teleostei, of which Crustacea (IRI% [Index of Relative Importance] = 80) and Mollusca (IR% = 16) were the most abundant prey groups. The trophic level was estimated at 3.50, which is similar to the results from other studies in the western and northern part of the Mediterranean and the Atlantic Ocean but is higher than in the North Sea. A new species of Euchondrus, Euchondrus adwani n. sp., is described from Syria. It is morphologically similar to E. desertorum Rochanaburananda in Forcart, 1981, which is endemic to the Negev desert. A new species in the family Pyralidae is described: Megasis kocaki sp. n., of which the adult, head and the male genitalia are illustrated. The new species is compared with the closely allied Megasis hyrcanella Ragonot, 1893. Both the genus and the species Gypsochroa renitidata (Hübner, 1817) are reported for the first time from Iran. Diagnostic characters of the species including figures of the wing and genitalia are presented. The record is confirmed by means of DNA bar-coding. Four new micropterous species of the genus Sunius Curtis, 1829 are described and il-lustrated from western Anatolia: Sunius akdaghensis sp. n. from Kütahya province, Sunius ciceki sp. n. from Balıkesir province, Sunius ozgeni sp. n. and Sunius cagatayi sp. n. from Denizli province. Additional records are presented for three species. The genus Sunius is now represented in Turkey by 36 species. The pseudoscorpion Hysterochelifer afghanicus Beier, 1966 is redescribed and illus-trated based on 21 specimens (13♂, 8♀) collected from different sites in northern, western, and southern Iran. A number of morphological characters and new provincial records are given. In addition, a key for 13 species of the pseudoscorpion genus Hysterochelifer Chamberlin, 1932 is proposed. Striped Hyaenas (Hyaena hyaena) in Grey Wolf (Canis lupus) packs: cooperation, commensalism or singular aberration?